When I lived in Lawrence, KS back in 2000, I lived at the Boardwalk apartments. Back in When I lived in Lawrence, KS in 2000, I lived at the Boardwalk apartments. Back in October of this year, one of the buildings burned down. It was pretty close to mine. 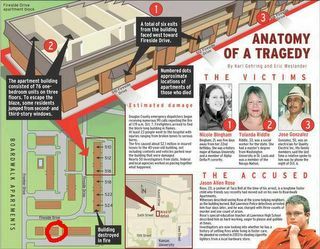 In the diagram, I circled the building that I lived in.